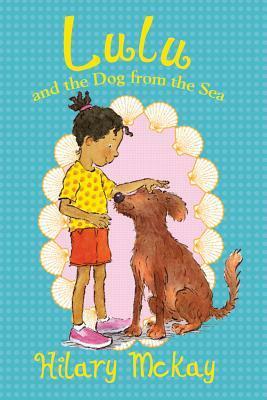 Lulu and the Dog from the Sea is Hilary McKay’s second adventure about a young animal lover whose compassion for animals in need often leads her into trouble. Set during the summer, this story takes place at the beach, where Lulu and her family take a vacation with Lulu’s best friend Mellie. On their first day in their vacation home, Lulu is warned not to befriend a stray dog who wreaks havoc on the neighborhood by digging through everyone’s garbage cans, but she just can’t help herself. The dog from the sea is obviously lonely - and hungry. Lulu is overwhelmed by the desire to save him, but to do so, she’ll have to protect him from the local dog catcher as well as from angry neighbors who would do him harm. A subplot involves Mellie’s difficulties with building a kite, the end result of which figures heavily into the fate of Lulu’s new canine friend. For more than two thirds of the story, I liked this book better than its predecessor, Lulu and the Duck in the Park. Whereas the first story focuses mostly on Lulu and her class at school, this second one delves deeper into her family dynamics, and into the personalities of Lulu’s parents. Occasionally, it shifts points of view so we get to understand the thoughts of Lulu’s own dog as well as the so-called dog from the sea. Lulu’s empathy for animals gets transferred to the reader so that, dog lover or not, the reader becomes invested in the well being of this particular stray dog. The writing is strong and evocative, and at times, even funny. In particular, I enjoyed the moment in chapter three when Lulu’s dog Sam reflects on the ill behavior of other dogs, and the narrator tells us that Sam would be surprised to learn that he himself is a dog. I also loved McKay’s descriptions of the beach atmosphere. I felt as though I could practically breathe the sea air. There is just one problem with this book, and for me, it was sort of a deal breaker. In the final moments of the story, when the tension mounts between the dog from the sea and his neighbors, the dog suddenly becomes Lassie. In episode after episode of Lassie, the famous collie has a sixth sense about his master, Timmy, and she is always running off to wells and mines and various dangerous places to rescue him. Essentially the same thing happens near the end of this book. I saw it coming, hoped desperately that it wouldn’t happen, and then found myself rolling my eyes as the book jumped the shark in a way I could not really forgive. Will kids who love dogs find the ending believable? Perhaps. This series is very sweet and gentle, and readers who don’t mind a mushy ending might buy into the easy way things wrap up for Lulu and the dog from the sea. For me, though, having read many chapter books, I thought this was too simple an ending to an otherwise beautifully written book. I felt that the author owed the reader a more realistic and less cliched finale, and it dropped my Goodreads rating from five stars down to three. Lulu and the Dog from the Sea is likely to appeal to fans of the first Lulu book, as well as to readers who like the Puppy Place, Vet Volunteers, and Critter Club series. It’s also a nice family-oriented alternative to some of the other girl-centric chapter book series where crushes and girl drama have taken center stage.